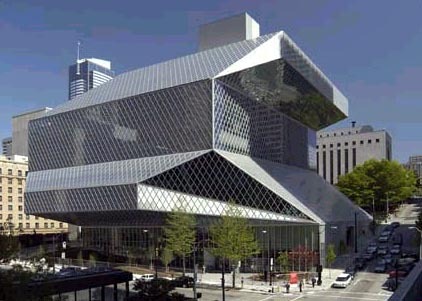 Today the Seattle Public Library, designed by OMA/Rem Koolhaas opens. Not being able to travel to Seattle yet to see the wonder with our own eyes, we give a short summary of the unanimous praise from the American press. At a dark hour, Seattle's new Central Library is a blazing chandelier to swing your dreams upon. If an American city can erect a civic project as brave as this one, the sun hasn't set on the West. In more than 30 years of writing about architecture, this is the most exciting new building it has been my honor to review. …the most important new library to be built in a generation, and the most exhilarating. Koolhaas has always been a better architect than social critic, and the building conveys a sense of the possibility, even the urgency, of public space in the center of a city. Seattle's new downtown library is so striking, so revolutionary, so odd and so lovely that one struggles to find a metaphor to explain it.